This stainless steel bottle holds hot or cold liquid on top, and in the bottom section, on-the-go essentials. Drink cold, filtered water or your favorite hot coffee from your Stow Away Bottle, and you may notice they have a wonderful new taste. That, friends, is the flavor of convenience. At the gym, the pool, the beach, yoga class, or on a hike, you'll relish the handy storage compartment in the bottom of the bottle. Surprisingly large, it can hold a handful of life essentials: snacks, keys, money, credit cards, headphones, lip balm, and/or a small recharger (sorry, your smart phone won't fit). The liquids section has a 24 fl oz capacity (that's two average cups) and its wide mouth top easily accommodates ice cubes. 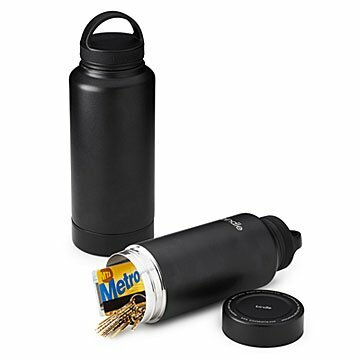 The screw-top lid has a loop for easy carrying, and the water-tight bottom compartment will keep your things dry. Savor the flavor of convenience and you'll never want to go back to the regular stuff. Made in China. Houston Max is not an engineer or a designer, but he is always looking for solutions to problems. He received his bachelor degree in Business Administration and Entrepreneurship from the University of Southern California, hoping to one day create a product that would solve a real life problem. He grew up in San Diego, and started noticing how people would cram keys, cards, cash, head phones, life into their board shorts' small pockets. He realized there was a need for a water bottle that also stored all our stuff. Now that he's created one, only one thing goes in our pockets: hands. The capacity of this bottle is only 20 oz., not 24 as advertised. It may be 24 if you fill it up to the very top, but if you want to put the lid on, which most people do for transporting and what not then the max you can fill it is 20 oz. disappointed in that. Would not buy as I don't care for things not accurately depicted in descriptions. Bottom of bottle also calls out 24 oz. so not just description that's wrong. It's base is too wide to fit in any cupholders as well. I'll stick with my S'well bottles. The bottom storage container doesn't hold much either. I like this concept. Keeps my drink hot or cold and keeps the clutter out of my pockets. Keeps my drink cold and the storage compartment is SUPER convenient for the gym. Its easy to use and fits my car keys and gym pass.